Chemtrails: chemical weapon or psychological weapon? Re: Chemtrails: chemical weapon or psychological weapon? I am not trying to dilute our great forum, I promise. Please understand that we have very high standards, even when discussing typical fakery, and there may be more important things to discuss, since — in all the discussions about chemtrails (which we faithfully and patiently avoid speculation on) we have not produced much hard evidence that such a thing would even have a precedence. Well, I believe that we should now seriously consider the possibility that it is. And this chemical experimentation ("authorized" by undoubtedly illegal language, in terms of how it violates basic human rights) is indeed something that would explain the fluoride poisoning of our water, chemtrails, experimental drugs and injections, and pretty much anything else that conspiracy theorists rant about. Here is the thing I came across, which I find very interesting. It's in a government document written to modify the present state of chemical and biological testing on not necessarily aware civilian populations, and how that is supposed to be reported to congress and authorized by local legislation. accounting is received by such committees. on the date of such notification. ducted on behalf of the Department of Defense by contractors. The odd thing about this modification and clarification, among others, is that it applied to the year 1979 and is certainly not the first writing on the subject, given the fact this is the edit of existing legislation. (Indeed, you can read the full existing public law here — the entire Title 50 on National Defense is hair raising: http://uscode.house.gov/browse/prelim@t ... ion=prelim) Furthermore, it may not be the last modification and one wonders: what causes this level of "public law" to be modified in the first place? And if it can be modified, how can we do so now, today, to ensure that tests of a chemical or biological nature are only done on people that willingly, knowingly, consent and volunteer, and who understand the risks? Unfortunately, what this implies as an answer to Simon's question (Why would politicians do this to themselves? ) is that politicians are the first to know the full extent of where and how the experiments take place. Might be time for another little FOIA action, hmm? In short, biological agents may be used to destroy, kill, maim or otherwise injure any and all life affected, given the subjects give prior consent — even in purposes of crowd control. How would such a scenario play out, and given the description of what constitutes "terrorists" these days, could it be "homegrown terrorism" is the new excuse for breaking biological laws? Now, how do you suppose the present maniacs in military and government, operating on the principles of "Doctrine of Discovery" (in which consent to receive conversion, colonization and genocide from the Euro/Anglo invaders was implied by mumbling something unintelligible to the wind) even define "consent" right now? And how do you suppose they reconcile biological agents used for "crowd control" of angry people obviously and blatantly not giving their consent to being attacked with biological agents? Are protestors all meant to sign some non-disclosure before meeting up and walking the streets? MrSinclair » February 16th, 2012, 6:25 pm wrote: From my office I have a great view of the sky and how they pollute it with chemtrails. One thing I see often are planes ascending at a steep angle no passenger jet would ever attempt. In 100% of the cases where planes are flying in these unusual trajectories they are leaving a chemtrail behind. I've witnessed this myself at least half a dozen times this year - a plane travelling at a ridiculously steep angle, nearly straight up, and leaving a fat chemtrail behind. It will typically intersect with another horizontal trail that was either sprayed previously or will be sprayed soon after about 20° to 30° above the horizon. The bizarre ascent angles is how I know these are NOT passenger jets. These are special planes flown specifically for the purpose of spraying whatever is in those trails. The planes that ascend normally never leave a trail as they do so. When there's a blue clear sky, I can spot plenty of planes flying at high altitude leaving no trail whatsoever (I live within 30 miles of two major airports - SFO and OAK - and I have good eyes). It's only some planes that make these trails, and they also fly at medium to high and very high altitude. I see them leaving trails at the same time other planes in the sky are not leaving any trail. I am determined to get some good pictures to illustrate this, but I'm almost always driving when I see them. Sadly, every Youtube video I've ever watched on the subject seems to be pushing some sort of disinfo. It's one of those things you just have to see and study for yourself. NotRappaport wrote: It's one of those things you just have to see and study for yourself. No amount of NASA damage control can explain away the steep ascents and the on-off patterns. WHAT IN THE HELL IS RADIATIONAL COOLING? That doesn't sound very healthy to me Paul. Would that have anything to do with your other newspeak descriptions like the Urban Heat Island or the Polar Vortex or the Temperature Inversion? Maybe it has more to do with weather phenomenon - you know the term you guys like to throw at us dumbed down masses when a large mass of geo-engineered weather forms an unusual shape or some other unexplainable weather shows up. We aren't all sheep, Paul. Maybe you should enlighten yourself to the gov't involvement in weather manipulation and be honest with us, that is if you're claiming not to know about it. Being a college educated meteorologist I would think your thirst for knowledge would have led you to at least a few sites or books about the government conducting weather modification programs. First of all, I generally do not respond to e-mails written in the antagonistic tone that you wrote yours. When people cannot communicate civilly, it’s much easier to delete the e-mails than engage that person. Second, I can only count on one hand the number of people that have complained about my style of online written forecast in all the years I’ve been putting it on our website. In fact, I get bombarded with thanks and compliments for being the only one in town that does this. People actually come up to me in stores and restaurants telling me how much they appreciate these forecasts. Obviously, I cannot please everybody. However, almost everybody prefers my forecasts to what they see elsewhere. Finally, I have been to dozens of meteorology conferences over my thirty-two year career…including a number of them in Europe. Never once at any conference, or in any scientific journal that I have seen has there ever been an atmospheric scientist who believes that chem trails are real. You can cite any website you want, but the bottom line on this and any science issue is the peer-reviewed science journals…that’s where scientists present their research and debate each other. If you follow the SCIENCE, there are no chem trails…just regular aircraft contrails. Wow, interesting. You mentioned a lot more than chemtrails. Maybe he's disturbed by the phenomenon too and this is the way he winks and pantomimes to you "Do not look behind the curtain!" Lot's of spraying today. I saw this one while driving earlier and pulled over to snap a picture. The trail was probably left an hour or more prior (didn't catch it in the act, darn it! ), but it shows the plane's flight path had made a complete 180 degree turn. Not the clearest picture, but I hope it helps demonstrate some of the insane manoeuvres these planes pull off. In this experiment, the scientists will fly two pair of rockets. One in each pair will measure data about the charged or "ionized" gas -- called plasma -- as well as the neutral gas, through which it travels. The other will shoot out a long trail of lithium gas to track the wind movement. The instrumented rockets are 40 feet long and 17 inches in diameter, carrying a payload of 600 lbs. The lithium rockets are 14 inches in diameter and are about six feet long. I'd heard of chemtrails but with the excuse that I haven't time to research EVERYTHING, dismissed it as nuttery. In central coast California we're in an extended drought, but three or four years ago on Beggars Night we had a cloudburst. The following morning the sky was magnificent-- a very high-domed saturated blue with white puffy clouds. I realized that I had stopped being conscious of the sky because it was no longer beautiful like this. So "chemtrails" came to mind, and I watched closely. The sky remained blue that day and the next, then the trails across the sky began. There were four trails, which spread out amazingly, covering the whole sky. Within a half hour we had a low-ceilinged bluish-grayish-whitish sky. Whenever the sky begins to turn pale blue, they are out there spraying again. If you want to investigate this for yourself, wait for a wind or rainstorm to restore the sky to normal. The chemtrails spread so quickly that you will have to look frequently once they begin to spray. I have never seen grid patterns like those shown on the internet. The planes cannot be commercial jets, because the necessary tanks would become public knowledge, so military jets flying very high are used, frequently very steeply climbing such that the stresses would be structurally unsafe for a commercial aircraft. We know that these are not contrails because they did not occur in the decades before this began. Also the sky was rarely overcast with a nearly colorless low ceiling. Commercial jets leave only infrequent quickly-vanishing short contrails, just as in the past. Fighter jets could very well leave long contrails but, as this would endanger them in a combat situation, they are equipped to prevent contrails. Even if such long contrails were possible they could not spread to create a low ceiling. In my opinion, only nanoparticles could remain suspended for days like this. Thank you, Penelope. I agree. The sky becomes a hazy color during spraying and the aftermath. Not a pure clean blue. I have seen them fly over and over a targeted area causing a build up where they target a population. I am still not sure why they do it but the fact they do it is undeniable to me at this point. I must say that I was quite skeptic about the chemtrail thing, but I've recently stumbled upon some news in mainstream media, where farmers from the Spanish region of Murcia say that some 'anti-rain' flights are taking place in their area, and demand further investigation. They have some pretty solid evidence: videos of light aircraft or small jets emitting short puffs of some substances, and analysis of ground samples showing high concentrations of heavy metals in the area where the flights were detected, contrasted with samples from other sites not affected by flights. ^ The Rain in Spain sprays mainly from a Plane? Their Telecoms signal must be dwindling and had to seed. HAARP, AFAIK has been for the study & occasional implementation of weather modification, although there is a suspicious amount of secrecy about it. Many have connected it to earthquakes. I don't know of any connection to chemtrails, but who knows? There has been a consistent program of abuse & mockery of chemtrails observers, with denial that chemtrails exist. For example even at WUWT, an anti- Anthropogenic Global Warming (AGW) site, the computer prevents the appearance of any reference to it. For people who nevertheless notice chemtrails, the first cover story is that they are contrails. For those who don't buy that the fallback cover story, told loudly and repeatedly, is that they are for weather modification. This story is closely identified with Dane Wigington, who is also a purveyor of the AGW hoax, and therefore probably a disinfo agent. Another cover story is that they are to combat global warming by increasing albedo (sun reflectance). The final story is that the chemtrails are for a military purpose, allowing better targeting or communications. I disbelieve all of these stories because none offers a reason for secrecy, and the mockery of chemtrails as nonexistent continues. 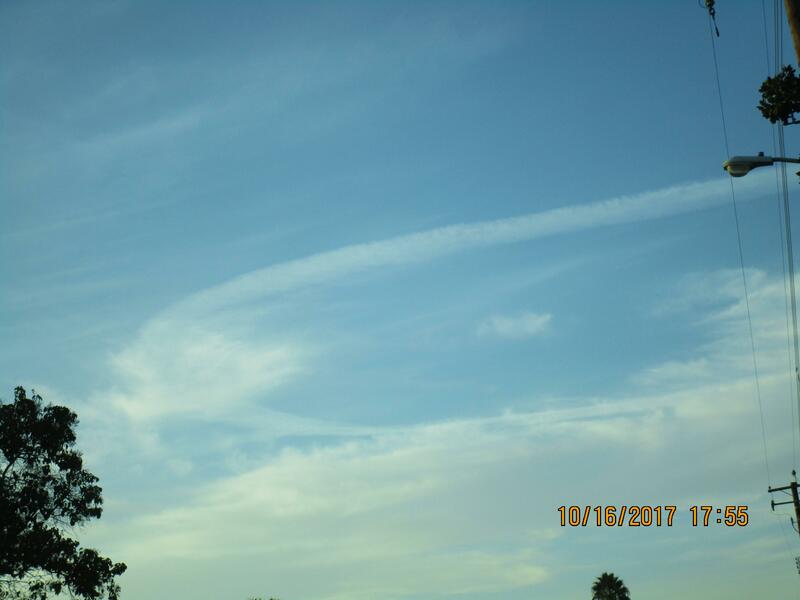 We are told a fairly consistent story about the composition of chemtrails, and that this composition of metals is building up on land and waterways. However, it's not possible to give credence to this unless someone whom one knows has done a chemical analysis, which I understand can be done by analysis of rainwater. There are reports that the mandatory sampling of lakes has shown an increase in these metals, but I haven't followed up on this. Penelope wrote: The final story is that the chemtrails are for a military purpose, allowing better targeting or communications. I disbelieve all of these stories because none offers a reason for secrecy, and the mockery of chemtrails as nonexistent continues. Assuming large-scale chemtrailing is necessary for the success of the revolution in wireless communication, one possible reason for the denial by the authorities is that it was implemented recklessly, with no previous study and public debate on health and environmental impacts. Had these hazards been known to the wider public decades ago, chemtrailing would still be on the drawing board. Ultimate global governance requires the atomization of humanity, which in turn requires giving up real life in favor of a wireless virtual existence. For the past 10 days there's been intermittent rain and snow in my part of CA such that I doubt there's been a single chemtrail within a 500 mile radius-- and all our electronics work fine. It's inescapable that global creation of a low hazy ceiling must diminish solar heat, light and UV. Covert operations require cover stories and we've been given a few, mostly designed to blackwash the teller. For those who follow the details of the Global Warming scam its obvious that we are almost certainly entering a Little Ice Age like the Maunder Minimum of 1645-1715. Those paying for the Global Warming scam know it's false and are responsible for chemtrails, knowing that it must hasten or worsen the cooling which likely has already begun. With the continuing degradation of our energy facilities and the increase of oligarchical control over agriculture (especially grain), this can be their Right Crisis.